This innovative interpretation of the Kalashnikov series is designed for our line of Boker Plus knives. The blade is made of AUS-8 stainless steel. 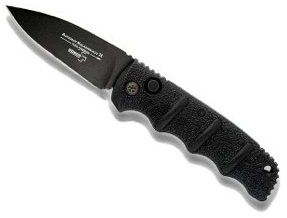 Structured finger grooves on the aluminum handle provide a secure grip. Push button lock (automatic open) with a black handle and black, plain edge, 3 1/4" blade.